Heat 3 inches of oil over medium high heat to 375°F. While the oil is heating, cut the root and tip off the onion and discard. 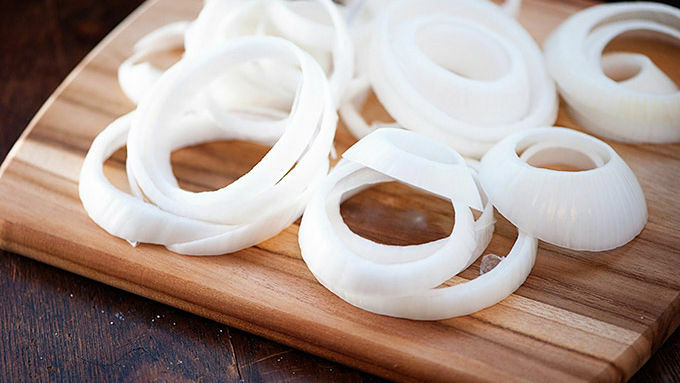 Slice the onion into 1/4 inch thick slices and separate the rings. 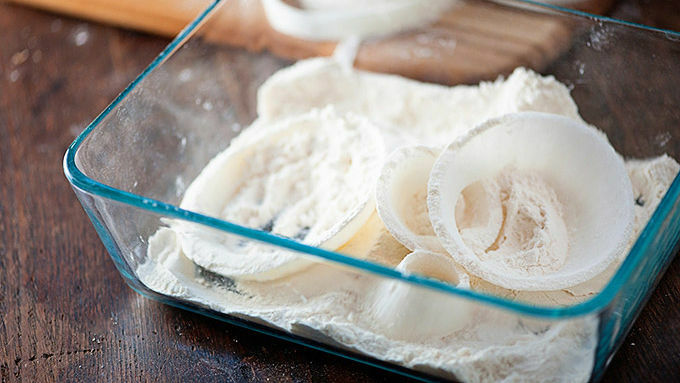 Add the flour and salt to a shallow dish and coat each onion ring in the flour. Shake off and set aside. Once all the onions are coated in flour, beat together the milk and egg and stir into the flour. Whisk until smooth. Coat the onions in the batter and shake excess off before placing on a cooling rack set over a baking sheet. Mix together the panko and Parmesan cheese and coat each onion ring in the breadcrumb mixture. Return to the cooling rack. Drop the onion rings, 3 or 4 at a time depending on the size of your pot, into the oil and cook for 2-3 minutes or until golden brown. 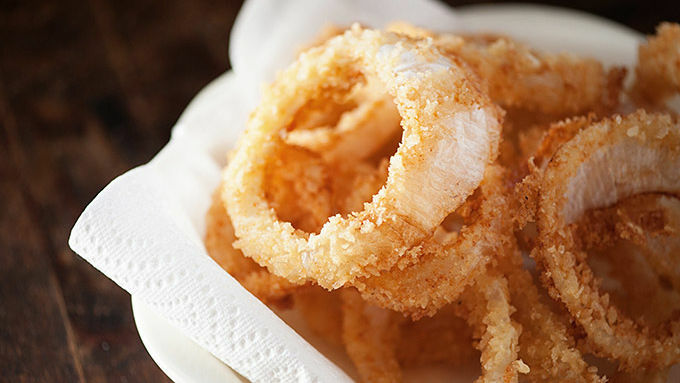 Remove the onion rings from the oil to a paper towel-lined dish for the grease to drain. Repeat with the remaining onion rings until all are cooked. 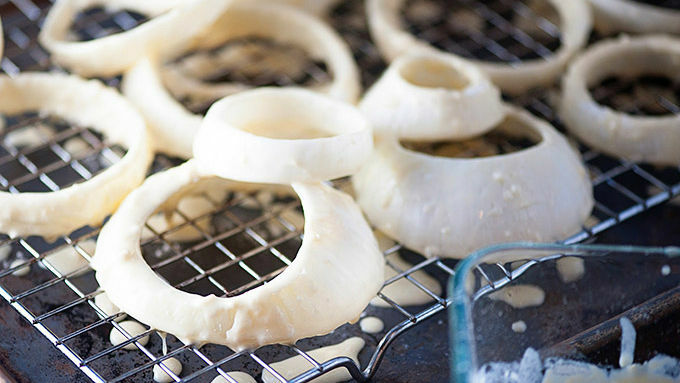 These onion rings are delicious with ranch dressing or ketchup! 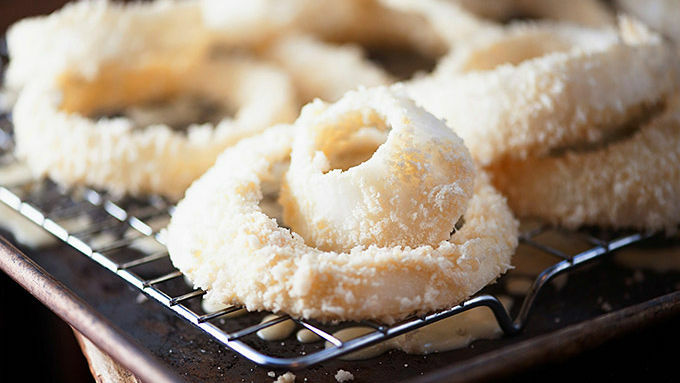 DIY a basket of onion rings the next time you're craving a snack. Sometimes, as I’m sitting in a restaurant with my husband, I regret all of my life decisions. Namely, marrying a man who hates onions. I just want to order onion rings for an appetizer and share them with someone. I don’t want to eat them all myself and I don’t want to be the only one with onion breath in the relationship. How do people dislike onion rings, anyway? They are deep-fried goodness! So I make onion rings at home when the husband isn’t around. I bask in all the onion breath and eat myself silly. 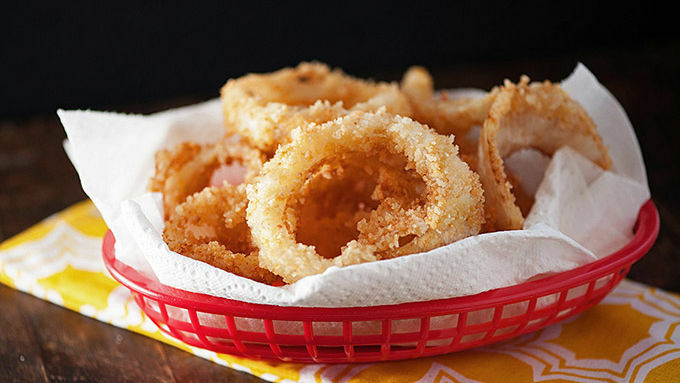 These thick-cut rings are super crunchy thanks to the Progresso panko breadcrumbs, and they have a nice salty flavor from the grated Parmesan. I like to serve mine with ketchup or ranch dressing, but I have to admit that these are just about perfect on their own! Enjoy!